Short courses of mineralogical interest were begun in 1965 in conjunction with the annual meetings of the Geological Society of America. Sponsored by the American Geological Institute Committee on Education and directed by J. V. Smith of the University of Chicago, short courses of feldspars (1965), pyroxenes and amphiboles (1966), sheet silicates (1967), and resonance spectroscopy (1968) were presented by mineralogists with expertise in these subject areas. With each succeeding year the course notes became more comprehensive and formalized, and AGI published these at low cost for distribution in the geological community. Unfortunately, AGI was been financially unable to continue this service. In 1973, MSA President J. V. Smith surveyed members of the Mineralogical Society of America concerning the desireability of renewing this sort of effort, and in response the MSA Council appointed a committee to initiate a series of short courses under their sponsorship. 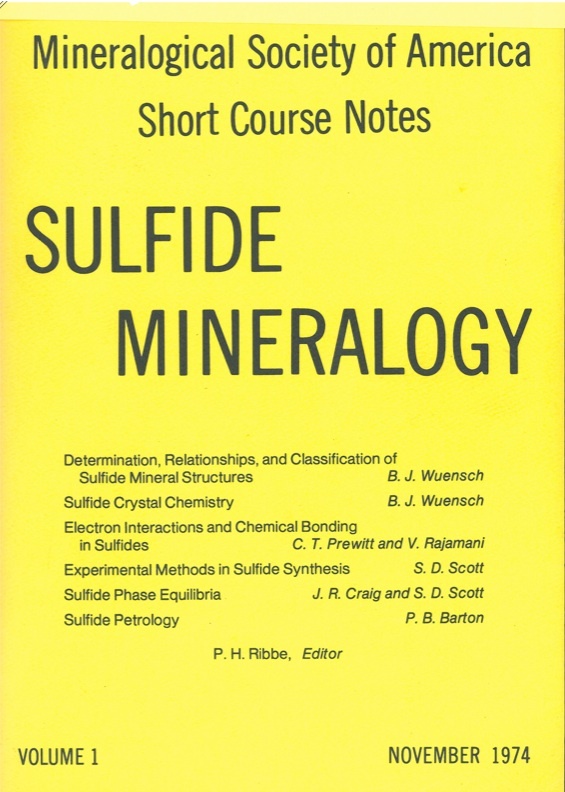 The mineralogy of sulfides was selected as the topic for the first of these courses, and the primary lecturers, J. R. Craig, C. T. Prewitt, S. D. Scott, and B. J. Wuensch, gathered in Blacksburg, Virginia in May 1974 to organize their presentation. The assistance of V. Rajamani as both coauthor and lecturer and P. B. Barton as special lecturer was enlisted, and the work of writing and editing this volume began. 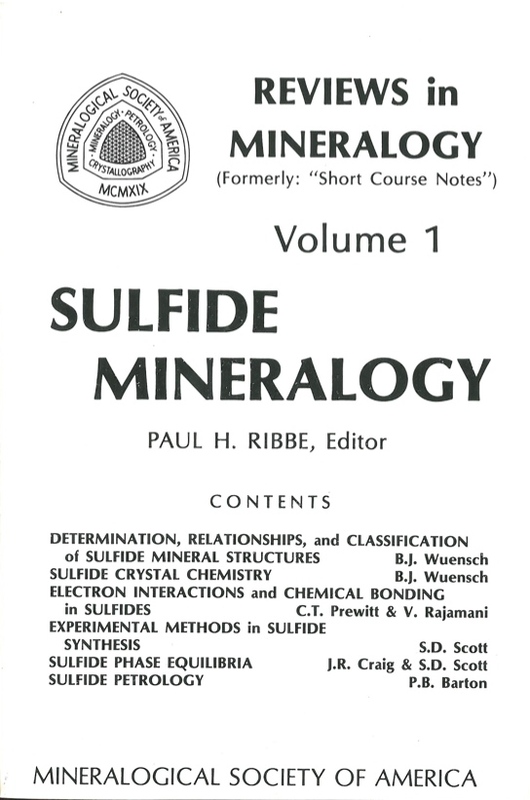 The Short Course on Sulfide Mineralogy was given November 15-17, 1974, preceding the annual meetings of the affiliated societies of the Geological Society of America, at the Sheraton Four Ambassadors Hotel in Miami, Florida, USA with eighty persons in attendance. by Bernhardt J. Wuensch, p. W-1 through W-20. by Bernhardt J. Wuensch, p. W-21 through W-44. by Steven D. Scott, p. S-1 through S-38. by James R. Craig and Steven D. Scott, p. CS-1 through CS-110. by Paul B. Barton, Jr. p. B-1 through B-11. p. 36 through R-37, References p. R-33.